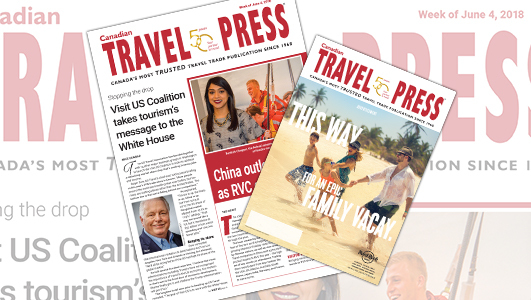 The role of the Chinese visitors in Canada’s tourism industry got extra attention at this year’s Rendez-vous Canada 2018, as cooperative tourism promotions by the two countries continue to take effect through the year, reports western editor, Ted Davis in this week’s digital edition of Canadian Travel Press. The buzz created by the Canada-China Year of Tourism 2018 is helping to drive a growing interest in holiday visits to Canada by Chinese visitors, as well as vice versa. Travel companies in China sent 93 tourism product buyers to RVC this year – the highest of any country in attendance. Trailing them were buyers from key markets like the USA, UK, Mexico, Australia, South Korea, Japan, India, Germany and France, to name some. In total, 602 buyers from 29 countries gathered at the Halifax Convention Centre to meet tourism product suppliers who had assembled from across the 10 provinces and three territories. The product suppliers numbered 1,154, including provincial marketing organizations and destination marketing organizations. They operated 461 booths on the trade floor at the convention centre, and took over 30,400 appointments. With a total attendance of 1,910 delegates, this year’s RVC achieved another record, surpassing the count of 1,851 that was tallied in Calgary in 2017. For the full story and lots and lots of photos, check out this week’s digital issue of Canadian Travel Press.